Priced for a quick sale, this very well presented, spacious 2 storey, 2 bedroom detached villa is located in a peaceful setting close to all amenities. 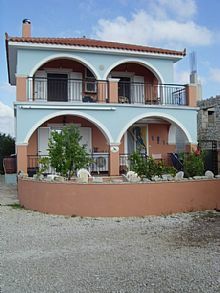 The villa is close to the sea (5km) and Zakynthos Town, Port and International Airport (5km). Built to a high standard, it has an open plan living/dining area, separate kitchen 2 bedrooms, a bathroom, covered veranda, large covered balcony with views, outbuildings, and garden. The villa sits on land of 541sq.m. The ground floor comprises an open plan living/dining area with fireplace and access to the covered veranda. There is a separate fitted kitchen. Marble stairs lead to the first floor which comprises 2 double bedrooms and a bathroom. Both bedrooms have fitted wardrobes and access to a large covered balcony with views over the countryside to the mountains. To the front of the property there is a gravel drive, parking for two or more cars, walled paved patio area, walled garden and garage. The rear is a laid to stone paving with barbecue, a vegetable garden, fruit trees and there is a storage shed. The price is only 139,500 euro.